Keela Nelli (Phyllanthus amarus, or niruri), a world-renowned botanical, is very effective in treating viral infection of the liver, specifically hepatitis B. It is anti-hepatotoxic, anti-lithic and anti-hypertensive. Useful in the treatment of kidney and gallbladder stones (active stones and as a preventative), colds, flu, tuberculosis, and other viral infections. Also, cystitis, prostatitis, venereal diseases, and urinary tract infections. It has also been proven effective in other liver diseases like jaundice and liver cancer. It is used to tone, balance, strengthen, detoxify and protect the kidneys and liver (and to balance liver enzymes). In the kidneys it helps to reduce uric acid and increase urination. The main constituents in Phyllanthus include; lignans (phyllanthine and hypophyllanthine), alkaloids, bioflavonoids (quercetin), and repandusinic acid. Repandusinic acid has been shown to have anti-viral properties in vitro. It is mildly diuretic and has demonstrated hypoglycemic effects in animals and humans. In ayurvedic medicine, it is used to treat diabetes. Phyllanthus niruri is very safe at recommended dosage. Phyllanthus amarus, or niruri, is the plant commonly referred to as Phyllanthus or Bhumyamalaki. It is a member of the Euphorbiaceae family. It can grow to 12-24 inches in height and blooms with many yellow flowers. The whole plant and its aerial parts are used for many remedies, mostly biliary and urinary. Keela Nelli or Paraparani Mi is a herb that has been used since Ayurveda for the past 2000 years ago, a large genus comprising of about 600 species of herbaceous plants, shrubs, nonsucculents and trees in tropical and subtropical regions. It is also known as Stone Breaker or Shatter Stone. This herb is a common weed that can be found in most parts of tropical countries; in fields, cultivated fields of cotton, maize, rice, coffee, banana plantations, gardens and on waste ground. It grows in wet soils. Keela Nelli, a small tropical shrub with big benefits for liver health, and more. This plant has been highly valued in a number of countries for its curative properties. In India the plant is often used by traditional medical practitioners for a variety of ailments, including asthma, bronchial infection and diseases of (and injury to) the liver. 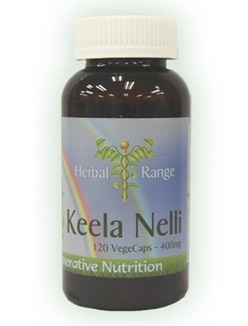 Keela Nelli contains lignans, flavonoids, several tannis, alkaloids and sterols. This plant also has many physiologically active alkaloids in the fruits, leaves and roots. The lignans, phyllanthin and hypophyllanthin, have been shown to be hepatoprotective against carbon tetrachloride induced hepatotoxicity in primary cultured hepatocyctes. Studies have already shown that the plant also contains flavonoids, fatty acids, and vitamin C to just name a few. In Ayurvedic tradition, the psychosomatic view of the human being sees the body organs and systems as a unit, and the digestive tract and functions as being of highest importance to health. The liver has a whole battery of functions, including: the formation and excretion of bile, which is necessary for digestion; keeping certain nutrients and fuel ready for the body to use, such as carbohydrates and lipids; manufacturing plasma proteins; activating specific vitamins; activating and deactivating body hormones; and detoxifying drug, chemical, and biological poisons, or toxins, that invade our body every day along with air, water, and food. The powdered leaves of this perennial herb were first used in clinical studies which looked at its usefulness in helping patients suffering from chronic liver damage due to extended hepatitis B virus infection. The hepatitis B infection leads to the inability of the immune system to get rid of the virus from liver cells. Infection with the hepatitis B virus is verified by detecting levels of certain viral components in the blood. In this carrier state, a patient is continuously harboring and carrying the virus. Following earlier studies showing beneficial effects in relation to supplementation with extracts of this plant and hepatitis B by S.P. Thyagarajan (Indian Journal of Medical Research 76:174, 1982) and P.S. Venkateswaran (Proceeding of the National Academy of Sciences of the U.S.A. 84:274, 1987), in 1990, S. Jayaram, and colleagues from the University of Madras, studied chronic carriers of HBV hepatitis. After 28 volunteers received Phyllanthus amarus in 250-mg doses for one to three months, 54.5 percent experienced loss of the carrier status. In 1988, at Madras' Hospital for Children and the Government General Hospital, S.P. Thyagarajan, and colleagues, once again reported their results in treating carriers of hepatitis B with an extract of Phyllanthus amarus. 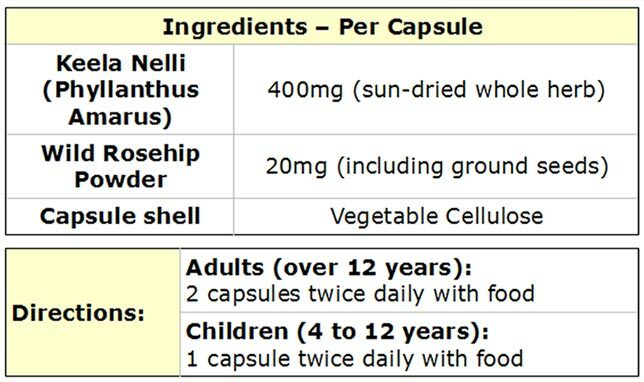 For a one-month period, the treated patients were given 200 mg of the extract in capsule form, three times a day. Fifteen to 20 days following the end of treatment, 59 percent of the hepatitis B carriers (22 of 37) lost their carrier status, which essentially meant that they no longer carried the disease. Only one out of 23 (4 percent) dummy-pill "treated" control patients irregularly lost their carrier status. Thyagarajan and Jayaram joined forces once again, in 1990, in a study which examined patients with acute viral hepatitis B. In this study, patients with acute viral hepatitis were given Phyllanthus amarus (250 mg, three times a day) for 30 days. The rate of "cure," or elimination of the virus, was 40 percent for those patients who received supplementation with this powerful botanical. Keela Nelli binds the hepatitis B virus surface antigen (HBsAg). Studies show that this plant has a potential in vitro antiviral activity against hepatitis B. This plant inhibits HBs-Anti HBs reaction and inhibits HBV DNA polymerase activity as well as other hepatitis-DNA-viruses such as the woodchuck hepatitis virus. In cell culture it downregulates HBV mRVA transcription and replication and inhibits enhancer I activity. One possibility is that Phyllanthus amarus may block the spread (proliferation) of the virus by directly blocking, or preventing, replication of the virus' genetic material. Hajime Ueno, and colleagues, at Japan's Medical and Pharmaceutical University, discussed Phyllanthus amarus (called niruri in their paper) and blood pressure control in a 1988 article which appeared in the Journal of Natural Products. These researchers, who were working as part of collaborative study between the Japan International Agency and the Republic of Paraguay, found that a component in the botanical held back, or was inhibitory against, the action of angiotensis-converting enzymes (ACEs), which, by definition, implicates the shrub as an important role-player in blood-pressure regulation, as well. In 1982, P.N. Ramakrishnan tested the herb's blood-sugar-lowering abilities vis-a-vis those of a widely used antidiabetic drug (tolbutamide) in an animal-model study. It was found that "the extract is capable of lowering blood sugar even after glucose administration," and that "the effect is more than that produced by tolbutamide," which is an outstanding result in, and of, itself. In fact, the authors concluded that the blood-sugar-lowering (hypoglycemic) effect achieved with this botanical is "significantly higher than that produced by the tolbutamide." For fighting chronic active hepatitis and liver protection, and for help with blood-sugar regulation, etc., a dietary supplement of 200 mg, three times a day, is most often recommended. It is known as "stone breaker" in Brazil as it is used as an aperient and laxative. It has also been used for urogential condition like gonorrhoea and for worm infestation and viral diseases. It is also widely used in local medicine in Africa and Asia with anti-viral, anti-HIV, anti-inflammatory, antioxidant, antibacterial and anti-diabetic activities. Do not take during pregnancy or whilst breast feeding; It has been documented with female anti-fertility effects in one mouse study. It may increase the effect of drugs used for diabetes, high blood pressure, and diuretic drugs.